These little nuggets are so good, rich, and they taste like the holidays!!!! Nowwwww, you CAN make these purely paleo, but I went a little different with them, and quite liked them. They are pretty rich, and the crush candy canes I added in add a great little crunch and sweet to the patty. The one thing I would do is use real chocolate for the bottom. The original recipe calls for cocoa powder and coconut oil as the chocolate portion, but I would go for the real deal to make it a bit sweeter! (You guys know I’m a fan of chocolate chips!!!) I’ll give you both recipes – my sweeter, crunchier, chocolatey-er version, and the original if you want to make it paleo! These make great little bite sized gifts – throw them in a little holiday ziplock bag from Michael’s and boom – you’ve got a perfect little holiday treat! 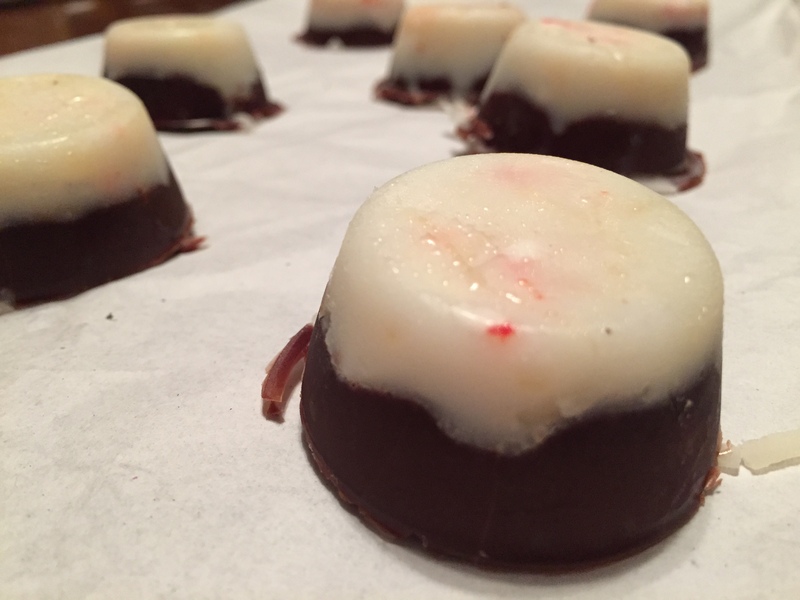 Mix together melted coconut butter, shredded coconut, and crushed peppermint. Mix together 2 tablespoons coconut oil and chocolate – use a double boiler or a pan over medium heat and make sure not to burn. When ready to eat, simply set the peppermint patty cups on the counter for about 5 minutes. I kept mine in the freezer to keep fresh and to keep from melting.